Happy 100th to Julia Child! I’ve been on a bit of a Julia kick lately, or at least she’s coming back into my radar, likely because of her 100th and smart marketing. I haven’t really been trying to perfect any one recipe lately, but instead have just been trying a bunch of different recipes as I try to expand my repertoire. This is where Julia comes in. Don’t worry, I’m not going to turn this into some Sheila and Julia thing, but her recipes are so exact and tested over and over, so I’d really like to learn some classic, standby recipes from her books. Like roasted chicken. Simple, easy, and delicious, but so important to know how to do right. This is not a Julia recipe, but has her stamp of approval so thought I’d give it a try. Unfortunately I left my camera at my friend’s house – I think I’ve turned into Hansel and Gretel, or just Gretel, and leave a trail everywhere I go – so my iPhone photos will have to suffice for the next few days. Also – today’s the day for the giveaway announcement! Scroll to the bottom to see who won. I found this recipe on the Gourmet Live iPhone app, which is a pretty fun app but still no replacement for the retired magazine. It’s by Sally Darr, a New York restaurant owner, and loved by Julia Child. It actually calls for an entire head of garlic per person, which I didn’t do, since that doesn’t really fly in our house. But I can imagine how delicious that version is. If you don’t eat potatoes, you may want to substitute other root vegetables such as carrots, beets, celery root, parsnips, etc depending on your preferences and needs. Pull out chunks of fat from chicken cavity near the opening. Wipe and dry chicken and sprinkle inside and out with sea salt. Mix together softened butter and thyme, or herbs of your choice in a small bowl. Ease skin away from chicken breast with your finger and spread one third of thyme butter under skin. Rub chicken inside and out with most of the remaining butter, reserving about a teaspoon. Put garlic cloves in a small heat-proof bowl and pour boiling water over them to cover. Let cloves stand for 10 minutes and drain. Peel cloves and dry them. While garlic is soaking, cover potatoes generously with salted water in a 3- to 4-quart pot. Bring to a boil and parboil 5 minutes (potatoes will not be cooked through). Drain and let cool until they can be handled, then peel. Strew garlic and potatoes around chicken. Roast chicken, basting 3 to 4 times with pan juices, for a total of 1 hour, or until the juices run clear when the meaty part of a thigh is pricked with a skewer or knife. 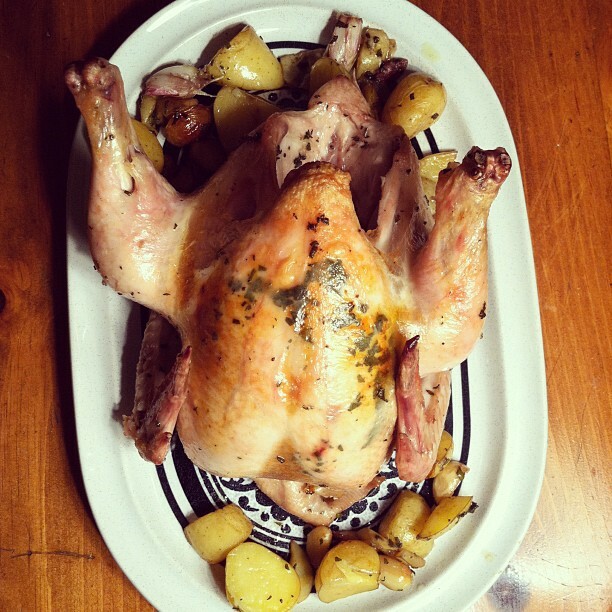 If the juices are pink, continue to roast chicken for 5 to 10 minutes more, or until the juices are no longer pink. Tilt chicken in pan to add any liquid in cavity to pan juices, then transfer chicken to a platter and let rest for 5 minutes. 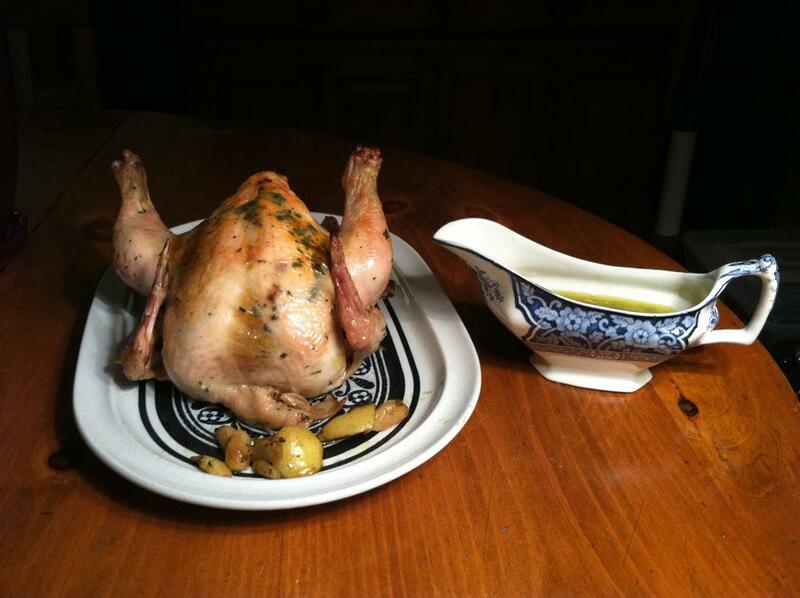 Use a slotted spoon to transfer roasted garlic cloves and potatoes to platter, surrounding chicken. Spoon off most of the fat from the roasting pan. Set pan over two burners on high heat. Add wine and deglaze pan, scraping up any solid bits clinging to the pan. Boil wine until it is reduced by half, then add stock and any juices accumulated on platter, and boil until liquid is reduced to about 1/2 cup. Remove pan from heat and swirl in 1 tablespoon cold butter, a piece or two at a time. Stir in lemon juice, and season with salt and pepper. Strain sauce over garlic cloves and potatoes and carve chicken into serving pieces. Thank you to everyone who entered the giveaway contest to win a copy of Diane Sanfilippo’s “Practical Paleo”! Congratulations to Airon W. on winning your own copy! I’ve sent you an email, so will be shipping it out to you. Hope you enjoy the book!